The First State Model Railroad Club was formally organized on July 9, 1985 to promote the hobby and educate the public on the important part railroads played in the development of the Delmarva region. One of the first goals of the group was to construct an HO scale modular layout depicting the Pennsylvania Railroad in Delaware. This layout was used for displays at various public places such as malls and historical events. The first public display by the club was set up in the Delaware Agricultural Museum on October 26-27, 1985. This remained the club home for a short time. 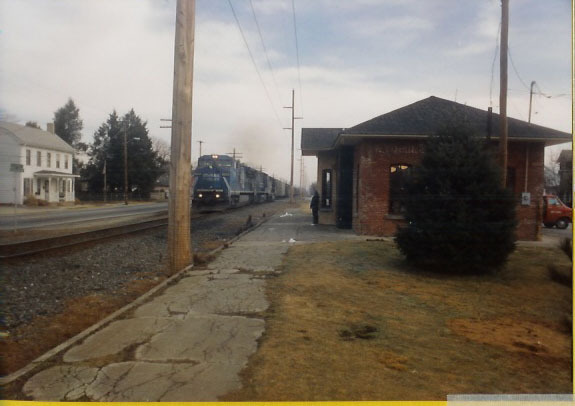 We then moved to the Wyoming Railroad Station in which we built what we thought would be a permanent layout. Unfortunately this was not to be as the town of Wyoming wanted to use the building as the town city hall. Recently we were offered the use of the Railroad Express building in Dover. The building is located at 1282 McKee Road and is ideal for our purposes, it has a large open room for us to set up our modular layouts when not on public display. There is also an office area where we hold our meetings. If you would like to share in the fun and wish to obtain further information, please contact us or attend one of our meetings. Our business meetings are held on the second Tuesday of each month at 7:30 pm. In addition we hold “work” sessions most Thursdays starting around 7:00 pm. If you are interested, feel free to stop in and join the fun (no appointment necessary).